ince the mid-19th century, women have shaped computing history. Today, only 20% of active computer programmers are women. Girl Develop It’s Salt Lake City chapter provides affordable education programs for women to create new opportunities for women and to restore the gender balance. In the 1840s, Ada Lovelace created algorithms for Charles Babbage’s Analytical Engine - making her the world’s first computer programmer. In 1952, Grace Hopper led the team that created the first compiler. Her team’s work paved the way for COBOL, a programming language still in use at banks around the world. In the 1970s, Adele Goldberg helped design and develop Smalltalk, the first graphical computer system. WE WANT YOU! The City Journals are excited to announce the addition of “Letters To The Editor” and “Photo Of The Month” in our new “The Resident Voice” section. A community without a voice is a powerless entity. Because news is the aggregate voice of the people, its importance depends on the belief that you can make a difference. 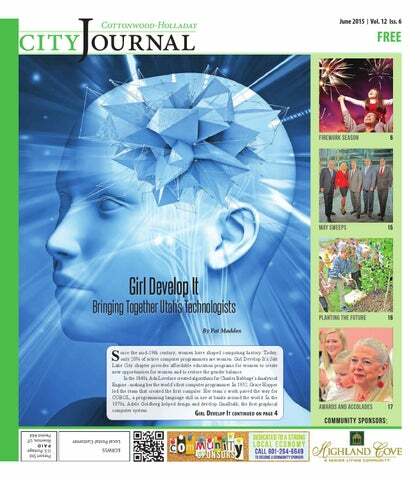 The editorial staff at My City Journals believes it to be vital to receive, hear and address the unique and invaluable voices of the community. GUIDELINES Letters To The Editor: Please submit letters to lewis@ mycityjournals.com with the subject line “Letters to the Editor” (along with which city journal you are submitting to); your letter should include a title and have a word count between 325-500 words. Photo Of The Month: Submit your photo to lewis@ mycityjournals.com with the subject “Photo Of The Month” (along with which City Journal you are submitting to). Please include your full name, in which city you reside and a brief caption describing your submitted photo. Letters To The Editor: Please submit letters to lewis@ mycityjournals.com with the subject line “Letters to the Editor” (along with which city journal you are submitting to); your letter should include a title and have a word count between 325-500 words. Photo Of The Month: Submit your photo to lewis@ mycityjournals.com with the subject “Photo Of The Month” (along with which City Journal you are submitting to). Please include your full name, in which city you reside and a brief caption describing your submitted photo. The Cottonwood-Holladay City Journal is distributed on the first Thursday of each month directly to residents via the USPS as well as locations throughout Cottonwood and Holladay. Our mission is to inform and entertain our community while promoting a strong local economy via relevant content presented across a synergetic network of print and digital media. For information about distribution please email delivery@myutahjournals. com or call our offices. Rack locations are also available on our website. free . community. papers . For subscriptions please contact: delivery@myutahjournals.com The views and opinions expressed in display advertisements do not necessarily reflect or represent the views and opinions held by Loyal Perch Media or the City Journals. This publication may not be reproduced in whole or in part without the express written consent of the owner. Why pay big corporate prices? CALL TODAY to setup an appointment to discuss your personal funeral needs, whether it is immediate or planning for the future. 801-263-7835 www.freedombaptistslc.com Pastor: Dr. Tom Corkish • Assistant Pastor: Mike Haxton Sunday School 10:00 a.m. • Morning Worship 11:00 a.m. Evening Worship 6:00 p.m. • Wednesday Evening 7:30 p.m.
tatistics provided by Salt Lake County Animal Services shows that in June 2014 this agency responded to 107 animal bites, 53 injured animals, 17 distressed animals, 47 animals running at large and 230 animals (dogs and cats) picked up by this agency. In July 2014, Salt Lake County Animal Services responded to 148 animal bites, 50 injured animals,11 distressed animals, 35 animals running at large and 262 animals picked up by SLCO Animal Services. In Holladay June 2014, Salt Lake County Animal Services responded to one animal bite, two injured animals, three animals running at large and seven animals picked up by SLCO Animal Services. In July 2014, in Holladay alone, SLCO County Animal Services responded to two animal bites, one injured animal, three animals running at large and six animals picked up. While we celebrate summer holidays with fireworks displays, our furry friends do not share our excitement. This is a reminder to all residents that July 5th is the busiest day of the year at animal shelters. Dogs are found miles from their homes, confused, disoriented and exhausted. People call hoping to locate a missing dog that was so terrified from fireworks that it crashed through a window, jumped a high fence or broke its leash or chain to seek comfort. Loans subject to credit approval; Terms and conditions apply. CottonwoodH olladay Journal.com Furry Friends continued from page 6 Be your dogs’ or cats’ best friend during firework time. Here are some helpful tips pet owners should consider: Be aware of when your city plans firework displays so you can get your pet ready for the noisy evening. Make sure your yard gates are locked and there’s no escape out of your yard. Many animals will want to flee to escape the noise. Confine your pet in their “safety room” 30 minutes before the fireworks begin. Check on your pet after the fireworks. They might be scared. Your presence will be soothing. Don’t fuss over them too much because they will pick up on your anxiety if in fact you are anxious. Do a yard sweep before letting your pet back outside. Look for the ends of sparklers, matches, and bits of leftover fireworks. These can be harmful to your pets if ingested. n May 12 Utah actualized nearly 500 new laws that span the legislative panoramic, with everything from seat belts to a law that reclaims Utah’s status as the only state with the firing squad as a legal way to execute. Firing Squad - Now a legal form of execution, this method will be used as a secondary tactic if drugs used for lethal injection are not available. Powdered Alcohol - If you were hoping to experience powdered alcohol, a powder that you can sprinkle into your water to give it an alcohol content, you’re out of luck … if you live in Utah. Utah made the sale of powdered alcohol, or “Palcohol,” illegal just a day after the Alcohol and Tobacco Tax and Trade Bureau approved the new product. Prepare your house. Turn some lights on as light will calm your pet instead of being scared in a dark room. Drown out bright lights by closing windows and drapes. Tune out external noise by turning on familiar sounds like the TV or radio. Make a “safety room” for your pet. Have a comfy bed and some of their toys. Remove any sharp objects just in case they start jumping around when the fireworks are going. Be sure you have water for your pet in that room. the second that can be waived upon completion of a 30-minute online safety course. Body Cameras – At the cost of nearly a half-million dollars, the Department of Safety has plans to equip all state police officers with body cameras. The new law mandates that police must be recording when carrying out forceful search warrants, in order to give the public a chance to experience what transpires when the rubber meets the road. After a long and much-needed rainy spring, summer is on the doorstep. We have two big events scheduled this summer; both occur in July. “Holladay, You’ve Come A Long Way” is the theme for our Fourth of July Celebration. We have activities scheduled throughout the day behind City Hall. We hope you will come out and enjoy the expanded open space and new playground facility. Please take a moment to reflect on the history of our independence. Many have and continue to sacrifice on our behalf. Please honor and remember them as you enjoy the privilege of living in a free society. Our annual Blue Moon Festival will be held on July 31st. Margo Richards and the Holladay Arts Council have worked very hard to ensure this year’s celebration will be the best ever! We hope you take the opportunity to come down to the City Hall to mingle with friends and neighbors, as well as spend some quality time with your family. Holladay City has committed a lot of time and resources in creating a central gathering place for our residents. The facilities are about 90% complete; let’s put them to good use. I hope to see you around town this summer! BREAKFAST ON THE COMMONS 9:00 AM!!! PLAYGROUND GRAND OPENING 10:00 AM!!! is available free of charge from the SSLVMAD). • Reporting other standing water to the SSLVMAD: 801-255-4651. Additionally, the following suggestions can help you avoid being bitten by mosquitoes: • Use mosquito repellents approved by the Environmental Protection Agency according to instructions on the product label. • Wear light-colored, loose-fitting clothing that covers as much skin as possible when outdoors. • Avoid outdoor activities during times of peak mosquito activity (between dusk and dawn for several species of mosquitoes including disease vectors known to occur in Utah). The South Salt Lake Valley Mosquito Abatement District would like to wish everyone a safe and pleasant summer. For additional information about mosquitoes and mosquito control or to submit a request for service please visit www.sslvmad.org. can expect a ticket. Same goes for picking up after dogs. Holladay residents are required by ordinance to clean up messes created by their animals. Failure to do so can also result in a citation and fine. Warmer weather also means more dogs outside, which leads to more lost animals or animals running at large. Summer is a good time to ensure your animals are properly licensed, tagged with contact information and micro-chipped. It’s the law to have your animal properly licensed and vaccinated, but adding a micro-chip and tags with owner information allows officers to quickly return a lost dog back to its owner. Our goal is to keep animals from entering the shelter. Friday, July 31, 5-10 PM This Free event will be held come rain or shine at the City of Holladay Park, located at 4580 South 2300 East, Holladay, Utah. The Blue Moon Festival has been growing in popularity each year and is fun for all ages. This year we are anticipating over 2,500 people to attend. It brings together the community with a fun filled night of Music, Art, Children Activities, Food, Beer and Wine. It will spotlight an outstanding array of Art and Food Vendors. We will once again have the Children’s Tent with free create and take crafts. If you are interested in applying as an Art or Food Vendor please visit our web site. PUBLIC MEETINGS: City Council – first and third Thursday of the month at 6 p.m. Planning Commission – first and third Tuesday of the month at 7 p.m.
on July 4th), July 21st to July 27th between 11am and 11pm (hours extended to midnight on July 24th), December 31st between 11am and 1am on January 1st, and Chinese New Year’s Eve between 11am and 1am the following day. For maps and other information on fireworks take a look around the city’s website at www.cityofholladay.com. You can also find safety information and an interactive map at www.unifiedfire.org/services/ fireprevention/firework.asp. Let’s all enjoy an exciting but safe summer. Household Hazardous waste is anything in and around your home that is poisonous, flammable, corrosive or toxic. It is many of your cleaning supplies, yard care chemicals, pesticides, fuels, batteries, used oil and antifreeze. NO TIRES or explosives (ammunition & fireworks). Dog Days of Holladay Celebration Saturday, August 22 9:00 AM - 2:00 PM Holladay City Plaza The City of Holladay, in partnership with Salt Lake County Animal Services will be supporting the canines in our community on the date and times listed above. Residents will be able to purchase a light-post post banner for $100 featuring their favorite Mutt in support of the event. $50 will be donated to Faces of Utah, the charitable arm of SLC Animal Services. There will be more information available in the July and August issues of the Journal. Activities available on Saturday, August 22nd: • Free Microchips for Holladay City residents: a registered microchip will give a lost pet the best chance of returning home. • Free Basic Vaccine Packages for Holladay City residents: (the basic vaccine package is DHPP for dogs and FVRCP for cats.) • Free Rabies Vaccines for Holladay City residents: this immunization is important, and it is also required in order to license your pet. • Licenses: If you live in Holladay City, all dogs, cats, and ferrets must be licensed. A pet license has benefits for you, the pet owner. A license is the best way to reunite you with your dog if he/she becomes lost. A pet wearing a license tag can quickly and easily be identified and returned to you. If your pet is found by one of our officers seriously injured and you could not be immediately contacted, the license would guarantee that he/she would be taken to a veterinarian for emergency care. • Activities for kids! Bring your kids by our booth for creative art projects, and also to learn about responsible pet ownership. • Adoptable dogs: Come see our awesome adoptable dogs if you are looking for a new pet companion! Adopt a new friend for life. Gr a nd O pe ni n g Saturday, July 4, 2015 at 10:00 a.m.
ount Olympus Senior Center is located at 1635 East Murray-Holladay Road. Phone 385-468-3130 for more information. Open 8 a.m. to 5 p.m. Transportation is available Monday through Friday for those who live in the area. The cost is $2; call the center for more information. Most activities require you to sign up in advance. Mondays, 11:15 a.m. — BP Checks with Ruth. Just show up. Tuesdays, 9:00 a.m. – Noon — Massages. We offer massages every Tuesday in June. Suggested donation is $10.00. Sign up for an appointment. Wednesdays, 2 p.m. —Afternoon Yoga. Work on your flexibility, balance, and muscle strength. Every Wednesday and Thursday Morning in June — Computer Lab. Don will take appointments to work with you one-on-one and answer your questions. Due to high demand, individuals may only sign up for two classes a month. Please sign up at the front desk! Fridays, 1p.m. — Vital Aging: Coping with Pain. Living with chronic pain can be very difficult. This class will provide an opportunity for individuals suffering from chronic pain to share their stories in an atmosphere of support and empathy. Information and guidance for dealing with chronic pain will be discussed. We will explore the mind-body connection to help find relief from pain, practice relaxation and distraction techniques. SENIORS will meet at Mt. Olympus Center for carpooling at 9:00. Sign up at front desk! June 8 signup for Father’s Day Celebration on the 19th. See Cheryl for this event at the front desk. Suggested lunch donation is $3.00. June 8, 10 a.m. — Eye Don’t Know. There are so many things we can do to take care of our eyes that we just don’t know about. Dr. Bowman, an ophthalmologist, will be here to inform us on how to take care of our eyes so they will last us a lifetime. June 10, 10:00 – 11:00 a.m. — Blood Glucose Checks. Just show up. June 10, 12:30 p.m. — It’s a “Secret.” What is a secret? What are some of the biggest secrets in history? And what are some of America’s biggest secrets? Join professor Matt Potolsky from the U of U as he dissects what a secret is, shares secrets throughout history, and explains how secrets affect our society. Riveting! June 11, 11 a.m. — iPad Class. Frank Barton from Right at Home will be back to teach his iPad class. Sign up at the front desk! June 12 Signup for June 16th Wendover Trip. Please sign up for this trip by Friday, June 12. A signup sheet is available at the front desk for your payment. Cost is $20.00 and is payable to Advisory Committee when you sign up. June 15, 10:30 a.m. — History of Music: Mexico. Cathryn Clayton, professor of Music History from the U of U Music Department will be here to acquaint us with the history of music in Mexico. Come enjoy the melodies and stories behind the music. Sign up! June 15, 11:00 a.m. - 1:00 p.m. — Attorney. Mike Jensen with Elder Law will be here for 20-minute sessions. Sign up at the front desk! June 16, 8:30 a.m. — Bus to Wendover. June 16, 9:00-11:00 a.m. — Eye Screenings. Dr. Nelson will be here to do free eye screenings. Sign up at the front desk for an appointment. June 16, 2 p.m. — Book Club. We will be discussing Everything I Never Told You by Celeste Ng. Books available through the library system. NOT JUST GREAT IN THE WATER! hard once again,” Crawford said. Tevita, who is going on to play with UNLV as a pitcher, has learned that baseball isn’t merely a game or a pastime but something that reveals the secret of character. “Sports have taught me that not everything is going to go your way. And when it doesn’t go your way you need to figure out a way to fight through it and be successful,” he said. Skyline High School’s Men’s and Women’s swim teams with Councilmember Sam Granato. Photo courtesy of George Karahalios two hours on Saturday mornings. That’s nearly 400 hours per swimmer and more than 30,000 hours in the pool in 18 weeks! And these kids don’t just swim! Of the 77 members of the Skyline Swim Team, 76 are enrolled in Honors courses; 64 in Advanced Placement courses; and 11 in International Baccalaureate courses; with a combined GPA of 3.61.
n September 10, 1954, KUTV Channel 2 Utah signed on the air for the first time. Sixty-one years later, they are the crème de la crème of broadcast news. From 5 a.m. to 10:30 p.m. throughout the week, they placed first in the ratings over every newscast in Utah, capturing 63 out of 72 quarter hours throughout the day and easily winning May sweeps. Out of all lifestyle shows, KUTV’s “Fresh Living” came in as nonpareil and the successful new social media show, “The Channel 2 10pm news team: Sterling Poulson, Shawna Lake, Mark Refresh,” continued its upward Koelbel, Dave Fox and Matt Gephardt. swing by winning its 3 p.m. KUTV and CBS took first in primetime time slot. 2News at 10 led the pack with easy programming, offering a staggering 19 of the distance; Mark Koelbel and Shawna Lake top 30 primetime shows. “We are so grateful to our audience helped make 2News at 10 the highest rated for tuning in each day,” said Lee Eldridge, local news program in Utah yet again. 2News “This Morning” gathered the KUTV news director. “We have a very loyal most viewers in the state, and CBS came out group of viewers, and our staff here at KUTV the victor in a battle for network news with works their hardest each day to provide the newscasts our audience deserves.” l CBS This Morning. Brock helps to plant the future as part of the Tree Utah education program. thropomorphic eye: “It’s important to plant trees because they can have feelings,” she said. Eight-year-old Naomi holds a more literal position for the necessity of trees. “I think trees are helpful because they give us fruits, and food helps us live,” she said. Brock, another third-grade student of Jueschke, is more scientific about it. He says, “It’s important to plant trees because they help us breathe. When you breathe out, you breathe out carbon dioxide and the trees take in the carbon dioxide as air for them and then they breathe out oxygen for us.” Myriad opinions aside, Jueschke projects a bigger picture. Left: GEF Excel Award Winner Trevor Black, a sixth grade teacher at Howard Driggs Elementary. Below: GEF Excel Award Winner Barbara Homer, a second grade teacher at Cottonwood Elementary. New hair ideas for Summer Kami Hair is a proud member of Haute Coiffure Francaise and the only member in Utah. Haute Coiffure Francaise is an elite international organization 62 years established and comprised of only 1,500 salons in 43 countries. Kami Hair attended the Haute Coiffure Francaise HCF, MCB hair show in Paris, France where they learned the latest fashions from around the world. Geocaching (geocaching.com) – Seek out a hidden treasure by using the free mobile app or your GPS. There are 1000’s of geocaches hidden, not only around Utah but worldwide, making this a great travel activity, too. Check out my post on Coupons4Utah.com for Kids Bowl Free (kidsbowlfree.com) – Kids can all the ins and outs of how it works. (coupons4utah. bowl 2 games for free each week at select bowling com/geocache) centers around the state. Shoe rental is additional and Barnes & Noble – Download a reading Journal from pre-registration is required on their website. the website or pick one up at the store. Have your child read at least 8 books during the summer and then take the completed journal to any Barnes & Noble store and your child can choose a free book. ummer season is the time when we are looking for things to entertain the kiddos and get them out and enjoying our fabulous Utah happenings. Here’s a handy list of things you can do with the kidlets this summer that won’t break the bank. Megaplex and Cinemark Theaters – have summer movie passes for kids. A pass is $5.00 to $10 for 10 movies. While these are older movies, kids enjoy getting out of the heat and seeing their favorite movies again. Visit your local theater for details. Splash Pads – Coupons4Utah has compiled a list of over 60 splash pads across the state. Visit one close to home or check the list for a vacation destination coupons4utah.com/splashpads. Flower beds, Hedges, Tree Trimming, Power Raking, Railroad Ties, Mowing & Hauling. Call 801.264.6649 to place an ad. HElP WaNtEd DRiVERs anD OfficE hElp nEEDED! PERFECT SUMMER JOB! GET PAID DAILY! Make up to $150 PER DAY! Must be energetic, good with people & at least 18. call: 801-266-1177 or apply in person: 4709 S 200 W., Murray 84107 M-F 10am-1pm. • Frameless shower Glass • Windows | doors • screens | solar screens Free estimates! Call Now! Call 801.264.6649 to reserve this space. sPRING ClEaNUP Trim & Prune. Tall weed mowing. Haul trash. up. Mowing, Trim, Edging, Aeration & Power Raking, Sprinkler Repair. Reasonable prices! Promote your business HERE! Call 801.264.6649 to place an ad. neighborhoods like adolescent Pied Pipers, picking up other unattended children. Then we’d end up in someone’s yard playing Red Rover (aka Clothesline Your Buddies) until those parents told us to get lost. We’d amble to 7-Eleven where we’d buy candy cigarettes and Fresca (because the can looked like beer). We’d sit on the swings sipping our pretend beer and discuss whatever it is kids discuss in those situations. I’m sure we fooled everyone because doesn’t every 10-year-old sit in the park swigging a cold beer while smoking with her friends?